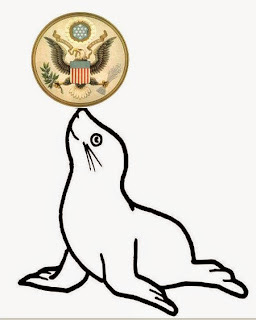 On June 20, 1782, the United States Congress adopted the Great Seal of the United States after six long years of debate and discussion. The front of the seal depicts a bald eagle clutching an olive branch in its right talon and arrows in its left. On its breast appears a shield marked with 13 vertical red and white stripes topped by a bar of blue. The eagle's beak clutches a banner inscribed, E pluribus unum, a Latin phrase meaning "Out of Many One." Above the eagle's head, golden rays burst forth, encircling 13 stars. It's scary when a piece of fiction *could* be true.